Considered by science as an actual organ, the thymus is situated in front of the aorta, at the back of the manubrium of the sternum, and in the uppper mediastinum. It’s a bi-lobed organ that shrinks continuously as the body is growing. In an adult body, the thymus is filled with a lot of fatty tissues and fibrous connective tissue strands. 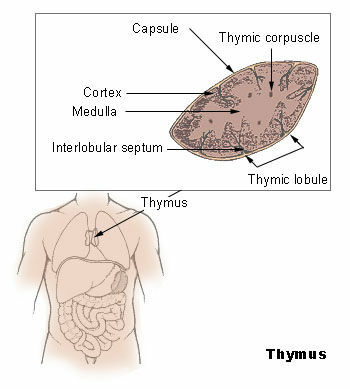 The thymus is classified to be a part of both the endocrine system and the lymphatic system. The thymus produces lymphocytes called T-cells. T-cells help the body fight infections by boosting the immune system. A hormone called thymosin is in charge of facilitating the T-cells when they get out of the thymus.